We have a show tomorrow night at Valentine's in PDX with Million Mists and The Woolen Men. Wet Hair were supposed to play but they had to cancel. Also Pete "DJ Swandive" Swanson is spinning funky booty bass, and it's his going away party so come see him off! Also we have a new tape on NNA called Emergent Layer. I should have copies for sale here within the week, but you can also preview/order from NNA. I'm pleased to be performing at the beautiful Chapel Performance Space in Seattle this Friday for the Gift Tapes Presents concert series. The space has beautiful stained glass windows and an extremely nice sound system, so I'm really looking forward to the show. 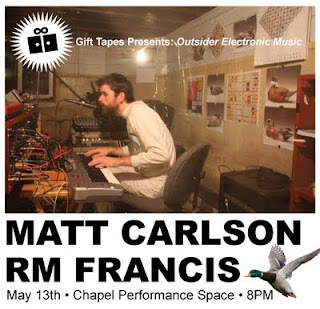 Also performing will be Seattle-based RM Francis who does real time compositions for computer. Should be a great night. If you happen to be in Seattle I hope you can make it.